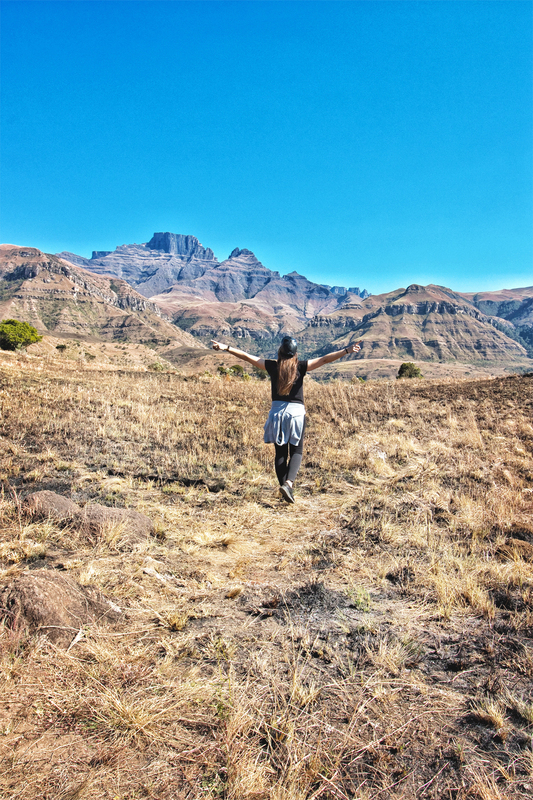 If you’re a regular Joburg-to-Durban (or Durbs to Jozi) road tripper and you haven’t added the majestic Drakensberg area to your stop along the way, then you’re really missing out on one of the most beautiful landscapes South Africa has to offer. A dramatic escarpment of glorious basalt peaks will take your breath away. 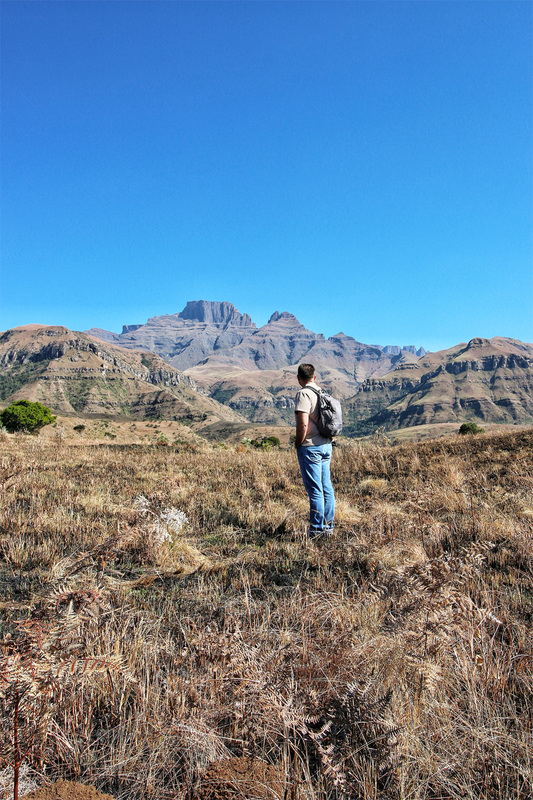 Sweeping vistas, flawless panoramas and stunning mountains, the Drakensberg is also home to the highest peak in South Africa. Towering at 3 482 meters, the Thabana Ntlenyana mountain, which forms part the Maluti Mountain range links South Africa with the Kingdom of Lesotho. It’s name literally translates to “beautiful little mountain” which is ironic considering its spectacular height. 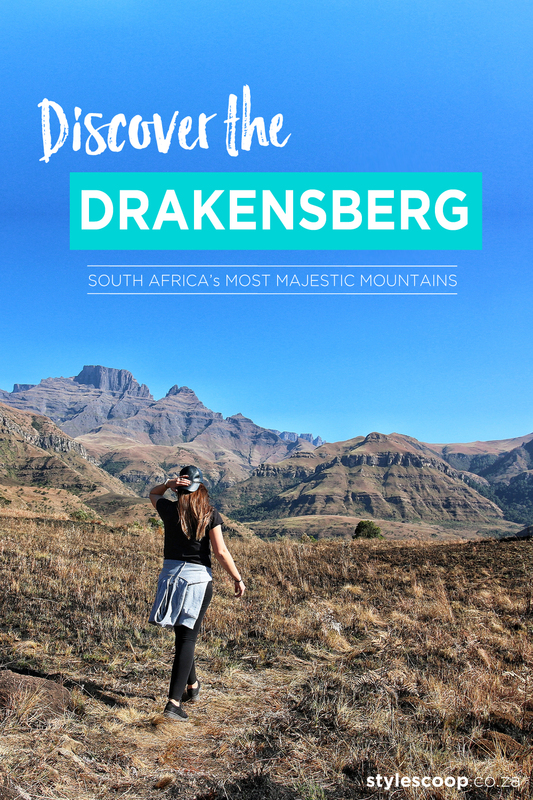 From Durban, the Drakensberg is a short 2-2.5 hour drive, and from Jozi it’s about 4 or 5 hours, making it the ideal mid-stop for your next road trip! Since I lived in Durban, we used to travel the route passing the Berg so many times, and can’t believe it’s taken this long to actually make the stop along the way for once! Well, it’s always been at the back of my mind – but then we plan our road trip and somehow the thought of adding a Berg stop gets missed. Luckily for me, I have the sweetest husband who actually made it happen this time by surprising me with a pre-Durban Mountain stay along the way! 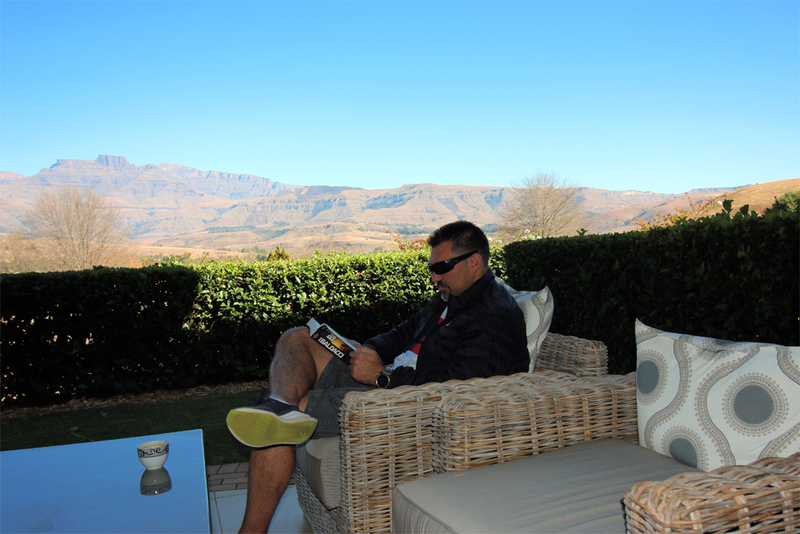 We spent two nights at Champagne Sports Resort in the Central Drakensberg area, and although Day 1 was not great – thanks to the very annoying sounds of construction interrupting our idyllic mountain escape and a B-Team reception on arrival, Day 2 was pure bliss. 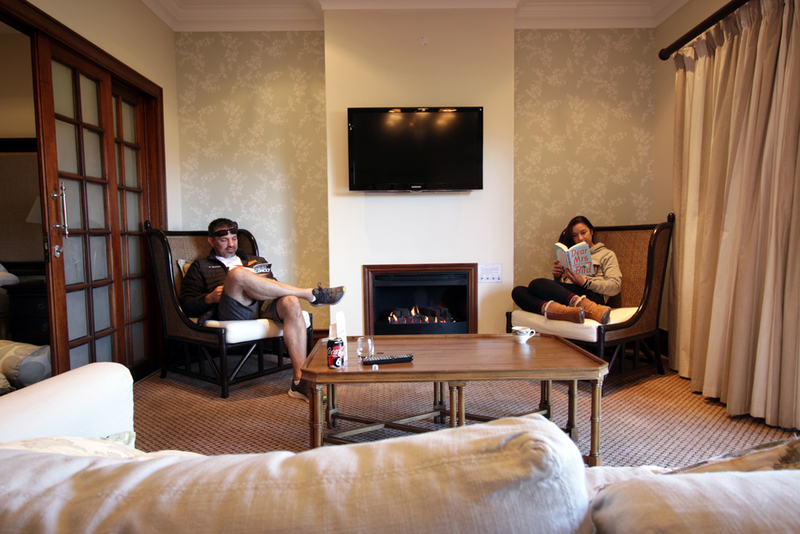 Cozy reading by the fireplace in our Suite. It’s a great resort that has everything really close by. From the resort, you can walk across the road to the little shopping centre, take a quick drive to the Canopy Tour and Hiking Trails and pretty much just enjoy a whole bunch of activities at the Resort itself. After we left, we heard that they have hiking trails starting at the resort, but we couldn’t find them and the reception desk was no help. They also couldn’t tell us how to find the Restaurant, so you can see what I mean about getting the “B Team”. Speaking of the restaurant though, you guys! THE FOOD IS AMAZING! Seriously, I’ve stayed at some pretty fancy places before and I must admit, the food at Champagne Sports was out of this world! There was so much food! Food in abundance, food, food, food! From succulent roasts to heart warming curries, casseroles to a huge range of vegetarian options and the mouth watering golden roast potatoes that seemed to never run out! Surprising, since I have also never experienced so many hungry people in one place. Every night the buffet was packed, and if the food wasn’t worth the elbowing and pushing, I might have suggested we go elsewhere to dine. But it was really more than satisfying! One of the best buffet’s I’ve yet experienced. Of course, Hiking is a big drawcard and they have various trails for what ever you desire. 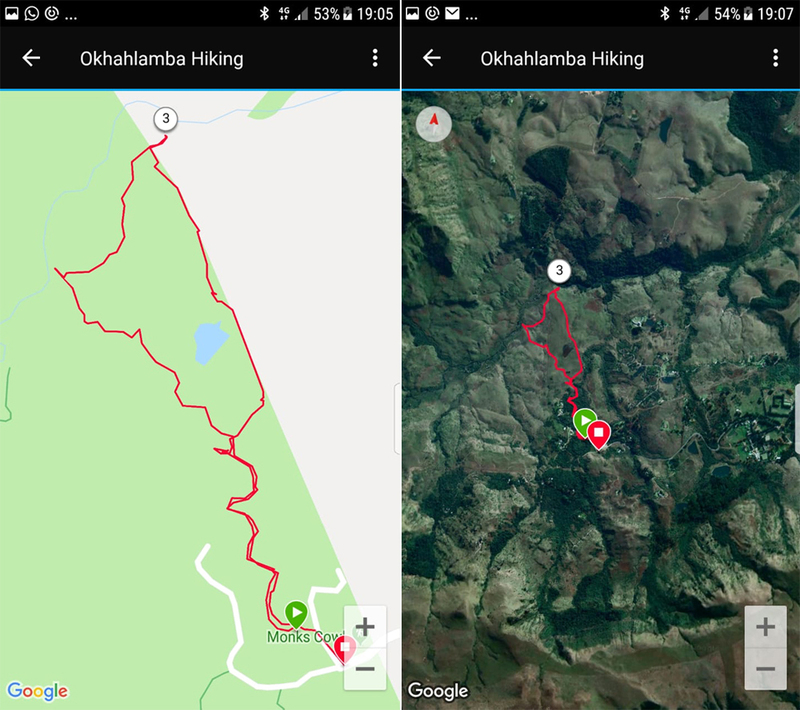 As much as I’d have loved to tackle Cathkin Peak (bearing in mind my fitness capabilities in my head are much stronger than they are in real life), we decided on one of the smaller walking trails that wouldn’t be too hectic and wouldn’t take all day. We spent just over an hour and a half exploring on the Sterkspruit Falls Walk – an easy terrain that took us on a beautiful walk to see the gushing Strerkspruit Waterfall and natural spring pools. 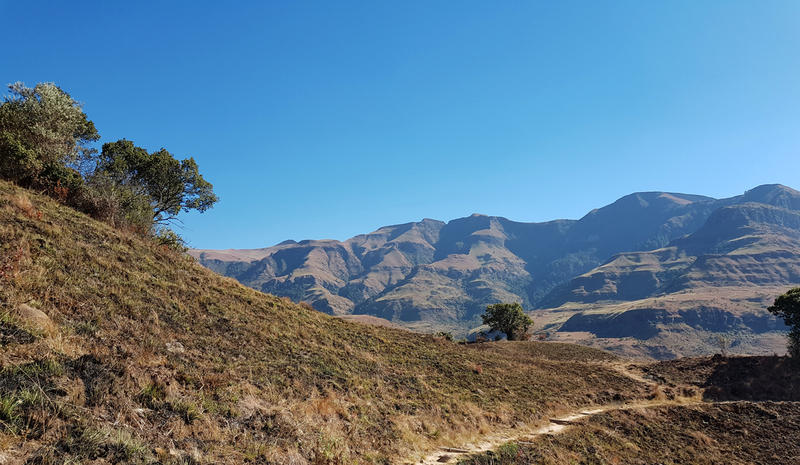 Entrance to the trail was R40 per person and started at Monks Cowl, where you can also take on the 1 Hour Spinx Hike, 5-hour Blindman’s Corner Hike, 5-hour Hlatikulu Forest Hike or the 3 Hour Gorge/ Nandi Falls Hike. Just make sure to pack lots of bottled water! And a swimsuit if you plan on hitting the hiking trails in Summer, where you can also take a dip in the natural rock pools! This activity is next on my Drakensberg bucket list. My folks honeymooned in the Berg, and there’s a photo of my mom sitting on her stallion with the mountain backdrop which has always given me the feels – since I was a little girl. We didn’t end up riding because watching someone bounce around on the back of a horse, made us think twice about hubby’s recent back op. Anyway, hopefully on our next Berg Adventure, this may be a fun activity to consider. Dragon Peaks Horse Trails offer daily rides which are both scheduled and non scheduled. They offer a day tour, overnight trail, ride and slide (with the Canopy Tour) and Starlight rides. Ushaka Horse Trails offer 1 hour, 2 hour, Half Day and Full Day trips where you can take on the Cliff Trail, Graveyard Trail, Poachers Trail and visit the Bushman Paintings. For the adventure junkies, the Drakensberg Canopy Tour offers some great cable fun! The tour features 12 slides that will give you a total of 1500m of fun through the enchanted Blue Grotto Forest. Their highest slide reaches 65m and their longest slide stretches out to 180m. Chocolate Memories is a delight that’s located across the road from Champagne Sports Resort (and safe to walk to). 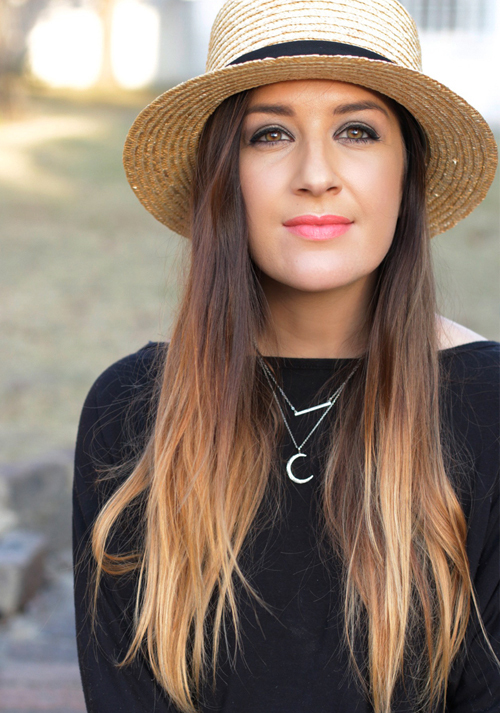 Go there to experience their artisan Chocolate that’s made in the foothills of the Drakensberg mountains. Here you can tantalise your tastebuds with syphon brewed coffee with truffles (try it with a drop of Chilli Essence) and Hot Chocolate in your choice of either dark, milk or white chocolate – served with hot milk and mini marshmallows that you pour into a cup and enjoy. 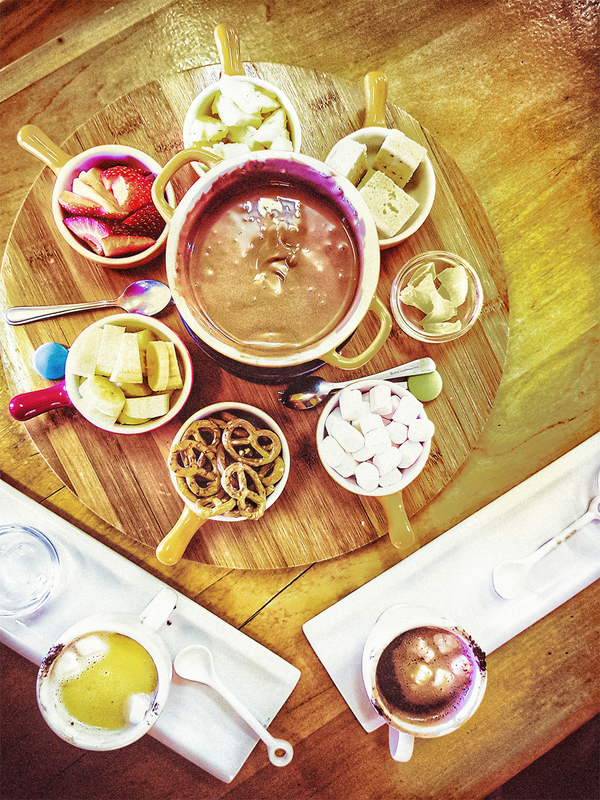 Their best indulgence however, has got to be their delectable Chocolate Fondue. A lazy Suzan with an array of dippy treats, including; fresh banana, strawberries and pineapple, sweet biscuits and salty pretzels as well as dried fruit and marshmallows. Again, you get to pick your choice of melted chocolate, but I can certainly give their milk chocolate my stamp of approval.